Enter Half Pint Vegan Dairy Butter! It behaves beautifully like butter, and the emulsified red wine and butter sauce is delicious. I like to make this with the little french type green lentils as they remain whole, but it can also be made with ordinary brown lentils which will cook more quickly, but you need to make sure they don’t fall to pieces. I usually eat this with some mashed potato or soft polenta. 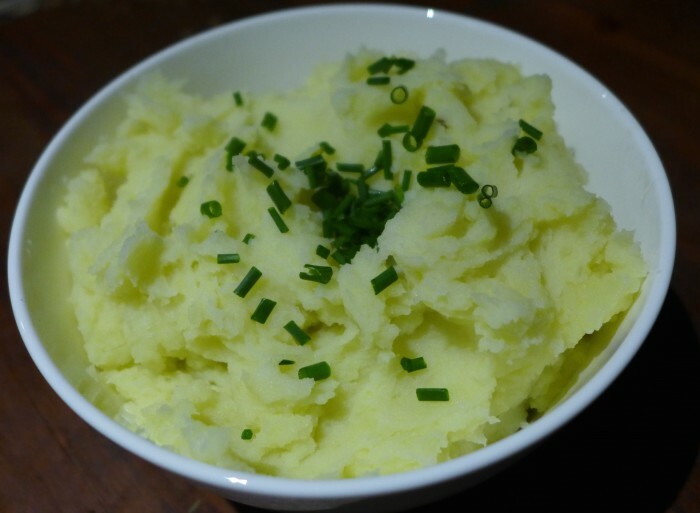 When I was little, my dad sometimes made the mashed potatoes to go with our dinner. I have really high expectations of mashed potatoes after that decadent richness and really didn’t believe that mashed potatoes with olive oil could be this good. Well I am so happy to find that they are. These are the most creamy luxurious mashed potatoes I have eaten since giving up butter. Sometimes I’ve also been adding just a smidge of truffle oil or a grating of vegusto parmesan to up the luxury a notch. But they are great as is and excellent with the lentils. Drain the lentils (discarding the soaking water) and add to the pan with the 2cups of water and some salt to taste. Cover and cook until the lentils are tender but not falling to pieces. If there is a lot of liquid remove the lid and turn up the heat to reduce it but not completely. You need some liquid left to emulsify with the butter and also if you over reduce it it will taste too strong. Stir in the butter, the remaining parsley and a dash of vinegar and salt to taste. Serve with polenta, mashed potato or toast. While the potatoes are cooking put the other two garlic cloves into the olive oil in a small saucepan over a very low heat for 15 minutes. Make sure the garlic doesn't burn. Remove the garlic. When the potatoes are really tender, drain (save the cooking water) and return to the dry pan over low heat to dry out for a bit. 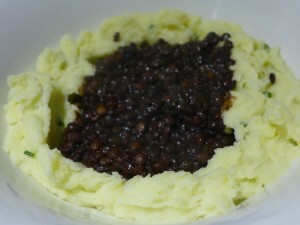 Add the garlicky olive oil and mash until there are no lumps. Add as much cooking water as needed to get a good consistency. Taste and season with extra salt. We have made this dish about 4 times in the last few weeks since discovering it!! Delicious! I have varied the ingredients to taste and used stock instead if water for a richer sauce on occasion … Thanks! It is one of my most returned to recipes. I love it, glad you do too.